2009-2012 Master of Art, Dept. of New Media Art, Taipei National University of Art. 2005-2009 Bachelor of Art, Dept. of Art, Taipei National University of Art. 2015 The Sum of Secret ll- The Snake in Mind, Hsiao Ximen Gallery Tainan, Taiwan. 2014 The Sum of Secret, Elite book store Art studio, Taipei, Taiwan. 2012 Mystic Plane, VT Art salon, Taipei, Taiwan. 2015 Center for Art and Technology OPEN DAY TNUA, Taipei, Taiwan. 2014 ài ài: an ambiguous time, Wingrow Art Gallery, Taipei, Taiwan. 2014 POST- movements：Nights of Café Müller, Kuandu museum of Fine Arts, Taipei, Taiwan. 2014 YES TAIWAN – Taiwan Biennial, National Taiwan Museum of Fine Arts, Taichung, Taiwan. 2013 Cutlog NY, New York, America. 2013 Home F(r)ictions, Kaohsiung, Taiwan. 2012 Tokyo Frontline, 3331 Arts Chiyoda, Tokyo, Japan. 2012 Transjourney – 2012 Future Media Festival, Taipei, Taiwan. 2011 Nintender, VT Art salon, Taipei, Taiwan. 2011 Art Taipei Made in Taiwan Young Artist Discovery , Taipei, Taiwan. 2011 FLU-FATIGUE video screening Exhibition, Taipei Contemporary Art Center , Taipei, Taiwan. 2011 Installation Art of Multimedia, My Transformed Family, Taipei Film Festival ,Taipei,Taiwan. 2010 King Car Education Foundation Condensation and Differentiation Exhibition,Taipei,Taiwan. 2015 ROC National Art Exhibition, New Media Art Category, Silver Prize, Taichung, Taiwan. 2014 The piece《Starring into a Chamber》, Art Pension Trust collected. 2014 The 9th Digital Art Festival Taipei Digital video, selected. 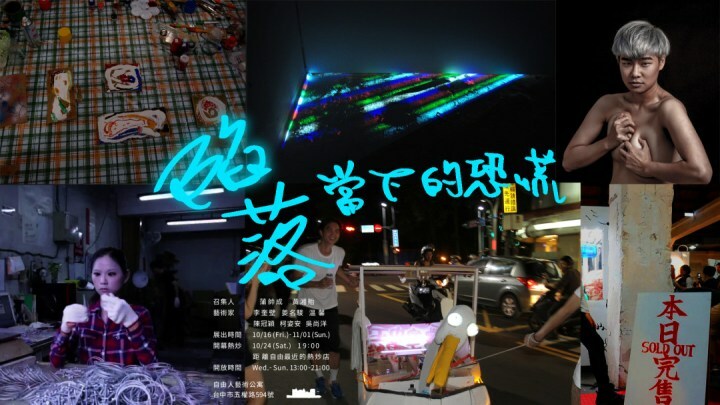 2013 ROC National Art Exhibition–Selected Works in New Media Art Category. 2012 The Funding of National Culture and Arts Foundation solo exhibition 120000NT. 2011 The 6th Digital Art Festival Taipei Digital video, First Prize. 2011 The Arising Artist Award of New Taipei City in Year 2011- Runners-up. 2011 ROC National Art Exhibition–Selected Works in New Media Art Category. 2011 National Taiwan Museum of Fine Art Young Artist Collection. 2011 The 9th Annual Taoyuan Creation Award First Prize. 2010 S-An Cultural Foundation Award. 2010 The 8th Annual Taoyuan Creation Award Runners-up. 2013- Master of Fine Arts, Dept. of Fine Arts, Taipei National University of Art. Born in 1989, Keelung, Taiwan.